The Indoor Volleyball Net, What're The Characteristics of the Net? The Volleyball Net, What're The Characteristics of the Indoor Net? The net divides one half of a full court and it's what players serve, block or hit over for their team to earn a sideout or a point. The indoor volleyball net is between two vertical poles that are connected to each other by fibers woven in a grid like 40-inch wide structure which separates two opposing teams during a volleyball match. The net divides one half of a full court from the other and it's what players serve, block or hit over for their team to earn a sideout or a point. The length of a net should be at least 30 feet and at maximum 31 feet, 6 inches long. "A (volleyball) net in this case is not a solid fabric but a woven structure that can be seen through and blocks the passage of large items, while simultaneously allowing the passage of small items, particles or fluids. Of course in our case we are talking about the volleyball net separating two opposing teams from each other. The net creates a vertical boundary in the middle of the court, that extends above the centerline all the way up to the ceiling. 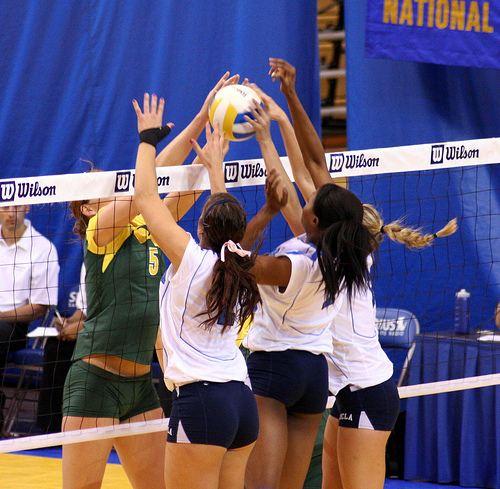 Like other net sports, volleyball players are required to contact the ball so that it stays in play while it travels back and forth over the net. Unlike some other net sports, if the ball contacts the indoor net it can still be kept in play in order to score a point or register a sideout. Its quite common, and legal, to use a net sleeve on the top of the net. This space on the net sleeve, usually 4 inches wide can be sold or used by event marketers as advertising space available for sponsorship purposes. For example on the net sleeve below the Wilson Ball Company name has been used and will strategically appear in any volleyball court photography taken during this match. The official indoor net height for the men is seven (7) feet 11 5/8 inches. For those who use the metric system, that's 2.43 meters. The indoor net height for women in the traditional six on six game is officially 7 feet four 4 1/8 inches. In meters that reads, 2.24m. For nine person volleyball, played dominantly in Asian cultures and communities the court is larger and the indoor net height, is lower at 243 cm. I share alot of individual, partner and easy-to-do volleyball serving drills we do in class with my followers. Many of these volleyball practice drills you can do at home by yourself or try at your next practice with your teammates. If you're a B team or JV player trying to make varsity next year...your goal should be to complete 1000 reps a day of at least three of the basic skills on your own...volleyball passing, serving and setting should be at the top of the list. Learn more about the Net. Or visit the pages in the Volleyball Rules section in the drop down menu at the top of the page. Net Height: What Is It For Men, Women, Coed and Sitting? Lines on the Court, What Do They Mean? Officials Who Are They And What Do They Do? What's The Volleyball Court Size Supposed To Be? 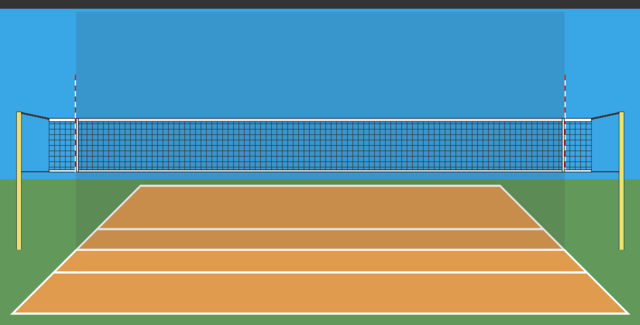 What Are The Dimensions of the Volleyball Court?